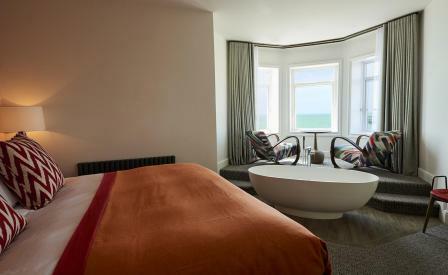 If bohemian beach breaks are your business, look no further than the recently completed Brighton Harbour Hotel. Its promenade location provides resplendent vistas along the south coast and across the English channel, while being in comfortable walking distance of both the Mark Barfield designed BA i360 viewing tower and the more longstanding regency opulence of Brighton’s Royal Pavilion. The 79-room hotel itself includes the The Jetty restaurant. Already a favourite in Christchurch, Dorset, Salcombe and Devon, the Brighton iteration sits in the hotel’s airy street-facing dining room and is awash with marble surfaces and bespoke carved ceiling lights – perfect for enjoying the modern British menu filled with dishes such as the twice baked soufflé with smoked haddock. The adjacent HarBar, meanwhile, offers a deluge of innovative tipples along with classic cocktails like a good old Manhattan or a Cuban Mojito. Perhaps most impressively of all, is the recently completed subterranean spa. Rooted firmly in the lower two basement levels of the hotel’s Georgian carcass, these underground relaxation floors offer indulgent treatment rooms, a sauna, steam room, Scandinavian ‘togetherness’ tubs along with gym facilities and the all important hydrotherapy pool. Perfect for when the sea air and the alternative vibe all get too much.